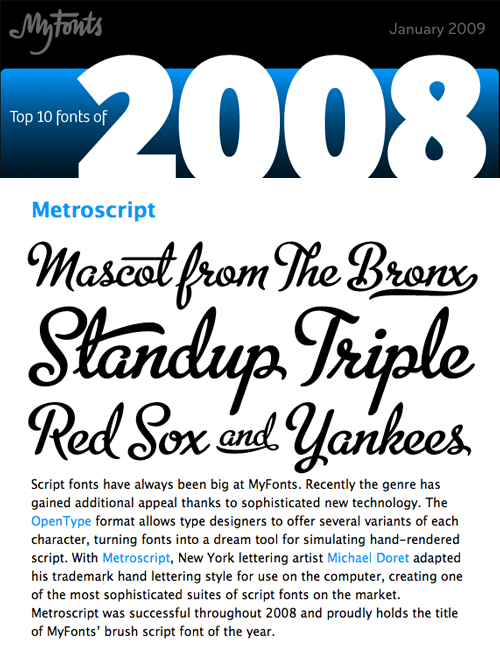 The lead item in the January ’09 issue of MyFonts News is reproduced below. I have been thrilled that this font has been accepted so readily by the design community (and beyond), and would like to thank Stuart Sandler of Font Bros and Mr Retro for his assistance in helping me realize this design. Congrats! The attention to detail in your fonts is what sets them apart from the rest of the quik/dirty designs that other sites sell. You’re an “old world” craftsman rocketed into our cyberworld. Keep up the good work. Thanks for the comment—and for all your support in the past. Keep up the good work! EXCELLENT !!! Wonder what took them so long to notice? I’m still loving my poster … framed, for all visitors to see. Thanks Michael! You did all the hard work! Congratulations! You are Man of the Year and Every Year in my Book!